Spitfire Mark IIA, P7290 AF-V, of the Air Fighting Development Unit based at Duxford, Cambridgeshire, in flight with another aircraft of the unit. Pilots of No. 607 Squadron RAF, returning from a sortie against Japanese troops attempting to cross the Sittang river, (The Battle of Sittang Bend), walk past their Supermarine Spitfire Mark VIIIs at the monsoon-flooded airfield at Mingaladon, Burma. Royal Air Force Operations: Airmen prepare a Supermarine Spitfire Mark VIII of No 607 Squadron for a sortie during moonsoon conditions at Mingaladon, Burma. Pilots of No. 607 Squadron RAF, leave their Supermarine Spitfire Mark VIIIs to cross the rain-soaked airfield at Mingaladon, Burma, after returning from a sortie against Japanese troops and shipping on the Sittang river, (The Battle of Sittang Bend). They are (left to right): Flight Lieutenant D A Pidgeon of Tadworth, Surrey; Warrant Officer W G Yates of West Bridgford, Nottingham, and Flight Sergeant R H Whittle of Bracknell, Berkshire. A Supermarine Spitfire Mark VIII of No. 607 Squadron RAF being serviced at Mingaladon, Burma, shortly before the Squadron's disbandment. Air Vice-Marshal C A Bouchier, Air Officer Commanding No. 221 Group RAF, greets Flight-Lieutenant D E Nicholson of Harrow, Middlesex, on completing the last operational sortie by No. 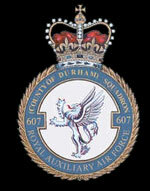 607 Squadron RAF prior to its disbandment at Mingaladon, Burma. Behind them, Nicholson's Supermarine Spitfire Mark VIII, JG354 'AF-Z', receives attention from ground crew.